Women walk through the Nahr Al-Bared refugee camp in Lebanon in 1951. 1. What is the Nakba? Nakba means "Catastrophe" in Arabic. It refers to the destruction of Palestinian society in 1948 when approximately 750,000 Palestinians fled or were forced into exile by Israeli troops. Because the Palestinians were not Jewish, their presence and predominant ownership of the land were obstacles to the creation of a Jewish state. Their exodus, or Nakba, was already nearly half-complete by May 1948, when Israel declared its independence and the Arab states entered the fray. Many Zionist leaders in Palestine openly favored "transfer" of the indigenous Palestinian population. Zionist forces used clashes that erupted as the British Mandate of Palestine came to an end in 1947-48 to rid as much of the land of its Palestinian inhabitants as possible. By the end of 1948, approximately 750,000 Palestinians - three-quarters of the Palestinian population - fled in panic or were forcibly expelled. It is estimated that more than 50 percent fled under direct military assault. Others fled in panic as news of massacres - more than 100 civilians in the village of Deir Yassin and 200 in Tantura -- spread. Zionist forces depopulated more than 450 Palestinian towns and villages, most of which were demolished to prevent the return of the refugees. (Figures of the number of towns and villages destroyed and depopulated vary. The Israeli daily Haaretz reports 530 lost villages.) These comprised three-quarters of the Palestinian villages inside the areas held by Israeli forces after the end of the war. The newly established Israeli government confiscated refugees' land and properties and turned them over to Jewish immigrants. Although Jews owned only about seven percent of the land in Palestine and constituted about 33 percent of the population, Israel was established on 78 percent of Palestine. 2. Why does the Nakba matter today? The Nakba is the source of the still-unresolved Palestinian refugee problem. Today, there are more than 4 million registered Palestinian refugees worldwide. The majority of them still live within 60 miles of the borders of Israel and the West Bank and Gaza Strip where their original homes are located. Israel refuses to allow Palestinian refugees to return to their homes and to pay them compensation, as required by UN Resolution 194 of 1948. Sixty-three years after the Nakba, Palestinians continue to be denied their freedom and independence. In 1948, 78 percent of Palestine became the state of Israel. Today, the 22 percent that remains continues to be confiscated for the expansion of Israeli settlements and construction of the separation wall. This ongoing denial of Palestinian rights combined with U.S. financial and diplomatic support for Israel fuels anti-American sentiment abroad. A 2002 Zogby poll, conducted in eight Arab countries showed that "the negative perception of the United States is based on American policies, not a dislike of the West." The same poll showed that "the Palestinian issue was listed by many Arabs among the political issues that affect them most personally, in some cases topping such issues as health care and the economy." Resolution of the Palestinian issue would improve America's image and create lasting goodwill in the Arab and Muslim worlds. 3. Who are the Palestinian refugees? Palestinians displaced/expelled from their homes in 1948. This includes Palestinians registered as refugees with the United Nations Relief and Works Agency (UNRWA), created in 1948 to aid Palestinians forced from their homes, and others who either were not eligible for international assistance or chose not to receive it. Palestinians displaced for the first time in the June 1967 war from their places of origin in the West Bank, East Jerusalem, and the Gaza Strip. Internally displaced Palestinians who left their homes or villages but remained in the area that became the state of Israel in 1948. Internally displaced Palestinians in the West Bank, East Jerusalem, and the Gaza Strip. 4. How many Palestinian refugees are there? Reliable figures on the Palestinian refugee and displaced population are hard to find, as there is no centralized agency or institution charged with maintaining this information, and there is no uniform definition of a Palestinian refugee. This includes Palestinian refugees displaced in 1948 and registered for assistance with the UNRWA (4.7 million); Palestinian refugees displaced in 1948 but not registered for assistance (1 million); Palestinian refugees displaced for the first time in 1967 (955,247); 1948 internally displaced Palestinians (335,000); and, 1967 internally displaced Palestinians (129,000). 5. Where do the Palestinians live today? 6. Do Palestinian refugees have a right to return to their homes? Yes, they have the right, although Israel has so far refused to recognize this right. All refugees have an internationally recognized right to return to areas from which they have fled or were forced, to receive compensation for damages, and to either regain their properties or receive compensation and support for voluntary resettlement. This right derives from a number of legal sources, including customary international law, international humanitarian law (governing rights of civilians during war), and human rights law. The United States government has forcefully supported this right in recent years for refugees from Bosnia, Kosovo, East Timor and elsewhere. The U.S. government supported Resolution 194, and voted repeatedly to affirm it until 1993. At that time, the Clinton administration began to refer to Palestinian refugee rights as matters to be negotiated between the parties to the conflict. Israel refuses to allow the refugees to return to villages, towns and cities inside Israel due to their ethnic, national and religious origin. Israel's self-definition as a Jewish state emphasizes the need for a permanent Jewish majority, Jewish control of key resources like land, and the link between Israel and the Jewish diaspora. Jewish citizens, residents and Jews from anywhere in the world are therefore granted special preferences regarding citizenship and land ownership. 7. What have leading Israeli figures said about the Nakba? Jaffa was the largest city in historic Palestine during the years of the British mandate, with a population of more than 80,000 Palestinians in addition to the 40,000 persons living in the towns and villages in its immediate vicinity. In the period between the UN Partition resolution (UNGA 181) of 29 November 1947, and the declaration of the establishment of the State of Israel, Zionist military forces displaced 95 percent of Jaffa’s indigenous Arab Palestinian population. Jaffa’s refugees accounted for 15 percent of Palestinian refugees in that fateful year, and today they are dispersed across the globe, still banned from returning by the state responsible for their displacement. 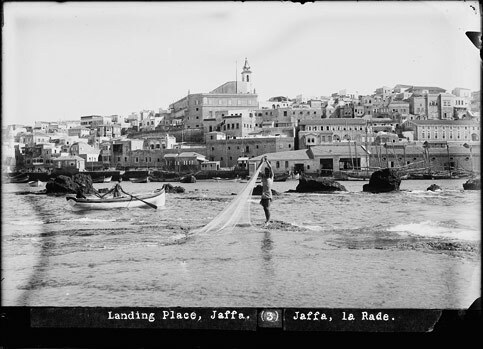 Jaffa was the epicenter of the Palestinian economy before the 1948 Nakba. 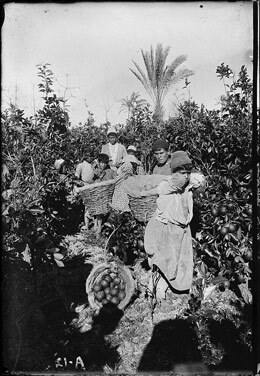 Beginning in the early 19th century, the people of Jaffa had cultivated citrus groves, particularly oranges, on their land. International demand for Jaffa oranges propelled the city onto the world stage, earning the city an important place in the global economy. By the 1930s, Jaffa was exporting tens of millions of citrus crates to the rest of the world, which provided thousands of jobs for the people of the city and its environs, and linking them to the major commercial centers of the Mediterranean coast and the European continent. 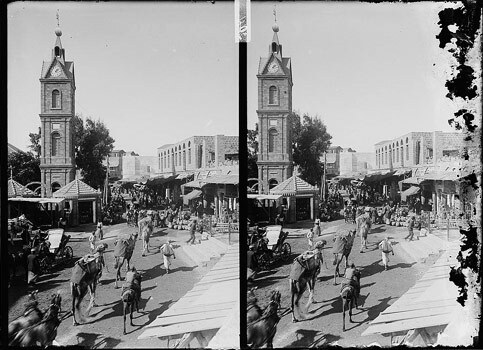 Jaffa was also the cultural capital of Palestine, being home to tens of the most important newspapers and publication houses in the country, including the dailies Filastin and al-Difa’. The most important and ornate cinemas were in Jaffa, as were tens of athletics clubs and cultural societies. The headquarters of some of these societies, like the Orthodox Club and the Islamic Club, have themselves become historic sites still testifying to the city’s cultural history. During the Second World War, the British Mandate authorities moved the headquarters of the Near East Radio broadcast studios to Jaffa, the studios becoming a cultural hub in the city from 1941 to 1948. With the growing cultural importance of Jaffa came increasing cultural exchange and interconnection with the main cultural centers in the region such as Cairo and Beirut, which further established the city as a cultural minaret in the region — lovingly dubbed the Bride of the Sea. Zionist forces initiated a cruel siege on the city of Jaffa in March 1948. The youth of the city formed popular resistance committees to confront the assault. On 14 May 1948, the Bride of the Sea fell to the Zionist military forces; that same evening the leaders of the Zionist movement in Palestine declared the establishment of the state of Israel. Approximately 4,000 of the 120,000 Palestinians managed to remain in their city after it was militarily occupied. They were all rounded up and ghettoized in al-Ajami neighborhood which was sealed off from the rest of the city and administered as essentially a military prison for two subsequent years; the military regime under which Israel governed them lasted until 1966. During this period, al-Ajami was completely surrounded by barbed wire fencing that was patrolled by Israeli soldiers and guard dogs. 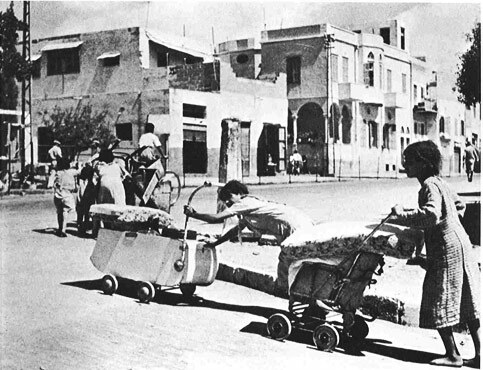 After expelling most of Jaffa’s residents, militarily occupying the city and ghettoizing the remaining original inhabitants, Israeli authorities passed the Absentee Property Law (1950) through which it seized the property of all Palestinians who were not in possession of their immovable properties after the Nakba. Through the implementation of this unjust law, the state of Israel sent its operatives to all corners of the land, surveying the properties left behind by the expelled refugees, the internally displaced Palestinians banned from returning to their lands, and those relocated to the ghettos of Palestine’s cities. Title to these lands, buildings, homes, factories, farms and religious sites were then transferred to the state’s “Custodian of Absentee Property.” This is how the Palestinians of Jaffa, the refugees and the ghettoized, had their properties “legally” stolen by the State of Israel. In the interviews conducted for our research, we heard dozens of stories from Nakba survivors telling us about how their homes, often just meters away from the ghetto, were seized, and how they could do nothing about it. Many told us stories of how their homes were given to, or simply taken by, new Jewish immigrants, and how they would try to convince the new residents of their homes to give them back some of their furniture, or clothes, or documents, or photographs. In some of these cases, the house’s new resident would give back some of the items, in most of the cases the response was to consider the original Palestinian owner an intruder, and to call the police or report him to the military commander. Former residents of the al-Manshiyya neighborhood, one of the city’s wealthier areas before the Nakba, described the sorrow they felt as they walked past their old houses, and the pain of seeing what remained of the neighborhood demolished to be replaced by a public recreation area. Some of the most difficult stories are those of the Palestinian farmers and peasants from the villages of the Jaffa district. They describe how they were forced off of their land, how they managed to stay in Palestine, how the Israeli government handed their land over to Jewish settlers, and how these settlers then hired the same Palestinian farmers to work on their own land as day laborers exploited for the personal profit of the Jewish settler off the produce of the land that Palestinians had cultivated for generations. In fact, after their properties and enterprises were seized or shut down, the vast majority of the Jaffa Palestinians who remained became cheap labor for Jewish employers. Their employment was contingent on their “loyalty” to the new state. And so it was that the people who ran the economic hub of Palestine before 1948, became its orphans feigning loyalty to the ones who orphaned them in order to feed their own children. After the creation of the State of Israel on the ruins of Arab-Palestinian society, the fledgling state began absorbing thousands of new Jewish immigrants from around the world, masses of immigrants whom the state was not fully able to absorb. The state resolved this lack of capacity by distributing the homes of refugee and internally displaced Palestinians to the new immigrants. After all the Palestinian homes in Jaffa had been occupied, Israeli housing authorities began dividing the homes in the Ajami ghetto into apartments so as to provide housing for Jewish families. As such, an Arab family in Ajami, who had been displaced from their original home, and whose family and friends had been expelled, and who lived in a house with four rooms, for example, would have their new home divided into four apartments to absorb three Jewish immigrant families, and the four families would share the kitchen and bathroom. The horrors of war, the loss of their country, the deep rupture in the social environment, the trauma of oppression, occupation, segregation and discrimination, the demolition or theft of their original homes before their own eyes, being forced to share their homes in the ghetto with the people who expelled them from their original homes, all combined to create an overall feeling of despair and impotence among the remaining community of Palestinians in Jaffa. This collective depression eventually led many of Jaffa’s ghettoized Palestinian residents down the path of dependency on drugs and alcohol as a way of escaping the burden of powerlessness in the face of colonial oppression. It was this form of colonial oppression that transformed the thriving Bride of the Sea to a poverty and crime-ridden neighborhood of Tel Aviv. In preparation for its occupation of the remainder of Palestine, and as internal opposition grew and information began to leak out that the “only democracy in the Middle East” actually had two sets of laws for two sets of citizens, the Israeli government formally abandoned the regime of military rule in 1966. While systematic discrimination against Palestinian citizens continued unabated, the 1970s witnessed the emergence of a relatively powerful political and social movement of Palestinian citizens of Israel. In Jaffa, this movement culminated with the formation of the Association for the Care of Arab Affairs in 1979. The Association was formed by activists and intellectuals who aimed to protect what remained of the city’s Arab-Palestinian identity and heritage, to fight the systematic discrimination faced by the Palestinians of Jaffa, and to spearhead campaigns on important issues facing the Palestinian community, foremost among them housing and education. It was in this same decade that “Judaization” of areas within the green line became publicly known as official Israeli state policy. While the main theater of Judaization during the 1970s was the Galilee in the north of historic Palestine, the Palestinians of Jaffa continued to feel increasing pressure to leave their homes in the city through various discriminatory policies and practices, such as those banning Palestinians from renovating their homes since these properties were largely registered as absentee property with title held by the state. The municipal authorities had ignored the neighborhood, allowing many houses to collapse, and in some cases ordered the demolition of Palestinian homes. As a result of these deteriorating conditions, most of the Jewish residents of Ajami had moved to the city’s suburbs, and were beginning to move to the West Bank in the newly built illegal settlements where the cost of living was, and continues to be, heavily subsidized by the state. The proportion of Palestinians in Jaffa had grown by the onset of the 1980s, both as a result of natural growth, and because a growing number of Palestinians displaced from the Galilee and the triangle ended up in Jaffa. Literacy and education levels among the adult Palestinian population in the city had also risen as the generation of the ’60s and ’70s grew and became active members of the society. This second generation benefited from the sacrifices of their predecessors, many of them having opened their own small enterprises like restaurants, contracting firms and car repair shops. A small number had also been able to complete post-secondary education in professional fields such as law, medicine, accounting, engineering and others. As such, the economic, social and demographic balance of the city had begun to restore itself. The issue of Palestinian housing in Jaffa is more than the sum of its parts; it goes beyond the hundreds of eviction and demolition orders. One cannot but connect the dots between Amidar and the Israeli Lands Administration putting up tens of Palestinian homes for auction, the rapidly increasing property value, the construction of the Peres “Peace” Center on confiscated Jaffa refugee property, and the establishment of a center for Jewish fundamentalists in the heart of the Ajami neighborhood. The picture we see when the dots are connected is worrying, the original inhabitants of Jaffa are uprooted, and their place invaded by those who have money and power: the elites of the Jewish-Israeli establishment. We see the state handing out properties to Jewish settlers almost for free in other Palestinian cities like al-Lydd and Ramleh as well as in the Naqab (Negev) and now Jaffa, while we, the indigenous people of Palestine are dealt with as illegal squatters and intruders. We, the Palestinians who remained in the part of Palestine taken by the Zionist movement in 1948 and who were forced to accept the citizenship of the state that usurped our country, now form 20 percent of the citizens of the State of Israel, but only control 3.5 percent of the land after most of our land and property were confiscated by this state. Since its establishment, Israel has created hundreds of new communities for Jewish settlement, but not one new community for Palestinians. One of the most prominent landmarks in the city of Jaffa is the clocktower built by the Ottomans at the entrance to the old city, long before Israel came into being. Today, Jaffa’s visitors and residents who care to take a look at the structure see a Hebrew-language plaque that states “In Memory of the Heroes who Fell in the Battle to Liberate Yafo.” From there, if we turn right to walk up to the old city we catch a breathtaking view of the Mediterranean Sea until we reach the informational signs posted by the Tel Aviv municipal authorities. Here we can read the history of the city covering thousands of years until the present day. One may be surprised to see that these signs are written in four languages, none of which are Arabic. More astonishing is that in none of these appears any mention of Arabs or Palestinians who only pop up in one line: “in the year 1936, Arab barbarians attacked the Jewish neighborhood.” More examples of the systematic erasure of the Arab-Palestinian history of the space abound, from the replacing the names of streets, neighborhoods and other landmarks in the city with Hebrew names, most often names of Zionist political and military figures. After the 1948 Nakba, Arab schools came under the control of the Israeli Ministry of Education, through which the Israeli intelligence services play a direct role in the selection of principals, teachers and curricular materials. In social science and humanities classes, Palestinian students in Israel learn about the history of Jewish communities in Europe, the heroic establishment of the modern Jewish state with no mention of the catastrophe that befell the indigenous Palestinian society of which they are a part. Schools are also a site of intimidation against any politicization, especially on important commemoration dates of the Palestinian struggle such as Land Day or Nakba commemoration. For the most part, Arab public schools are largely neglected in the allocation of funding and resources, and the quality of education is very low relative to the schools of the Jewish community. This drove many Palestinian parents in Jaffa to send their children to Jewish schools, a phenomenon that amplified the identity crises facing many of the city’s Palestinian youth, as well as their difficulty with the Arabic language. In response to the Israeli establishment’s efforts to Judaize Palestinian space and consciousness, the Palestinian movement in all of its currents has worked to entrench Palestinian steadfastness and dignity. Despite the various processes facing Palestinians in the “mixed cities” that we have described, Palestinians in Israel have remained strong and held our heads up high. For decades, the Israeli authorities have played a carrot-and-stick game to transform Palestinians into a servile minority called “Arab-Israelis,” a minority with no connection to their Palestinian identity, with a collective amnesia of their relationship with the land around them and of the ongoing crimes committed against them and most importantly, loyal to their jailers. Beginning systematically in the 1970s, the Palestinian rights movement consistently challenged Israeli policies and practices with such mobilizations as the 30 March 1976 general strike commemorated as Land Day, and the hundreds of actions taken in support of the first and second Palestinian intifadas. The movement pushed the Palestinian struggle out of its superficial national and religious confines to an internationalist struggle in which Palestinians and Jews struggled side-by-side for justice. In Jaffa, this struggle has managed to bring about some tangible victories, among them stopping the municipality from transforming the beach into a waste-dumping ground, pressuring the Israeli authorities to build housing units for Palestinians in the city, and establishing independent Arab educational institutions such as a nursery and the Arab Democratic School which opened its doors to students in 2003. This struggle has been the main factor enabling Palestinians to remain steadfast in their historic city. Today, the struggle continues under the banner of the Jaffa Popular Committee for the Defense of Land and Housing Rights (also known as the Popular Committee against House Demolition in Jaffa) which was established in March 2007 as a direct response to the hundreds of eviction orders issued to the Palestinian residents of the Ajami and Jabaliya neighborhoods of Jaffa. The importance of the Committee’s work soon became clear to its members when their preliminary research revealed that 497 Palestinian homes in Jaffa were under threat of eviction and/or demolition by the Israeli Lands Administration, which had also put up many of these properties — all of them “absentee” properties — for auction. The Popular Committee is made up of residents, social and political activists, movements and organizations and political parties operating in Jaffa. The Committee represents the collective struggle of Jaffa’s Arab-Palestinian residents, and is open to membership to anyone who agrees to its demands and political basis of unity. A central aspect of the Committee’s work is pressuring the various arms of the Israeli authorities (the Israeli Lands Administration, Amidar, Tel Aviv-Yafo Municipality) to freeze all legal actions taken for the purpose of eviction, demanding that these authorities enter a dialogue with the Committee instead, in order to reach an agreed-upon solution. The Committee also demands an end to any and all sale and auction of “publicly owned” (i.e. absentee/refugee) land, and entering a dialogue with the committee to implement a system that guarantees the long-term Palestinian presence in the city, and that enables youth and young couples to find affordable housing in the city, particularly in the Jabaliya and Ajami neighborhoods. 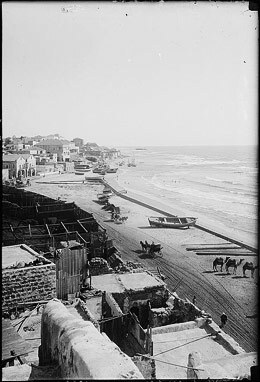 The motivating spirit of the campaign launched by the Popular Committee is the need to wrest recognition of Jaffa’s Arab-Palestinians as a group with a historic rights to the land and properties of the city, and that as such, alternative solutions to Jaffa’s housing problem must be reached in consultation and with the consent of indigenous community. The Popular Committee also works on information gathering and research mainly from the directly affected residents of Jaffa facing eviction and home demolition; direct action to prevent eviction and home demolition which has involved mobilization of activists to be physically present in homes slated for demolition; organizing popular activities such as pickets, protests, information forums and others; as well as a media campaign to raise awareness about the plight of Jaffa’s Palestinian community in local and international media. We are constantly looking for ways to fundraise both for our legal costs and for activities to enable youth, women, and young couples to find affordable housing. Increasingly the committee has taken on organizing extracurricular activities for youth, and workshops to support women and youth to run their own businesses with the understanding that the economic viability of the community is directly linked with our ability to remain steadfast.